Our farmhouse tables are all fully customizable. You can choose from our many options to create the perfect farmhouse table for your home. If you want to make a change from our standard options just give us a call and we can provide you with a custom quote. This table comes in 6 standard sizes and also has an option of a solid top table with no extensions or adding up to fourteen extensions. You can choose your wood and finish plus your leg and table style. This truly is a custom built farmhouse table just for you! 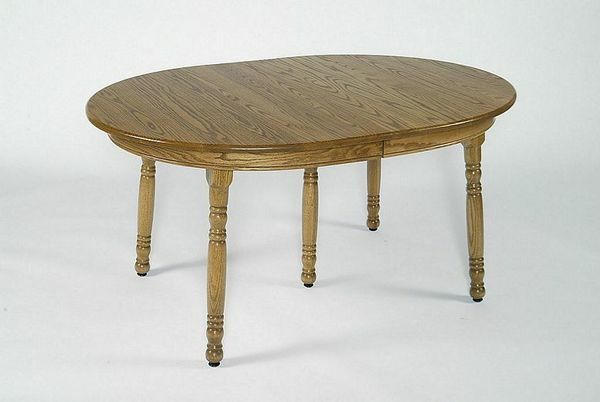 Oval tables are a popular choice for families with young children that are running around the house. With an oval table you don't have to worry about sharp corners that little ones can run into. Questions on this farm table, ready to order, need help finding dining chairs, want stain samples or a custom quote then just give us a call at 1-866-272-6773 or stop by our Amish furniture store in Sarasota, Florida.